Insider Tip on a Winter Stay at Dollywood’s Resort: Ask About Packages! 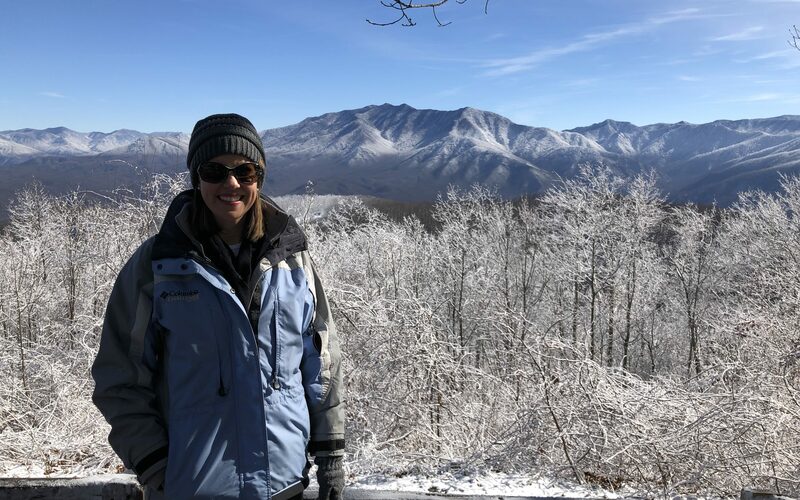 A winter trip to the Smoky Mountains is not complete without two things: a stay at Dollywood’s DreamMore Resort and Spa and a visit to Ober Gatlinburg. 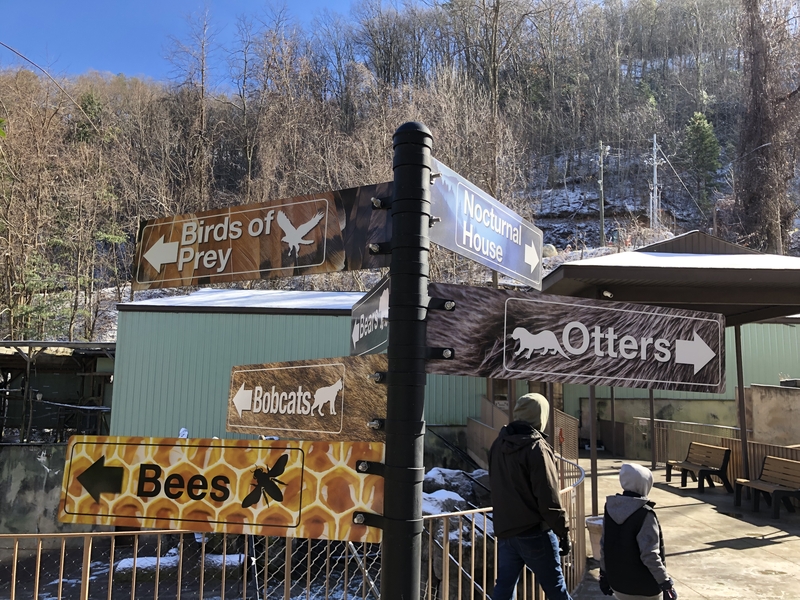 And, brilliantly, Dollywood partners with Ober Gatlinburg to offer the experience as a package option for their wintertime guests. Ober is a ski area and amusement park that offers a mountaintop of fun! 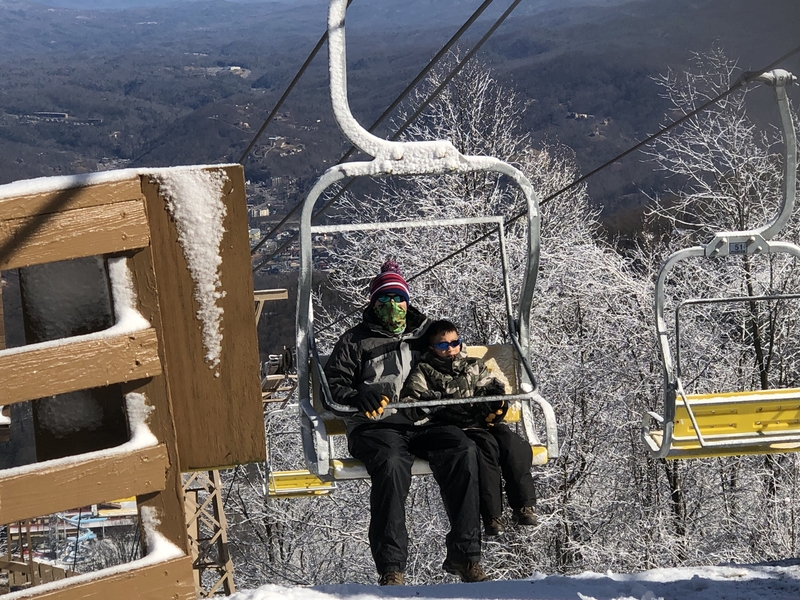 It provides the perfect combination of Smoky Mountain views and winter sports to make any chilly day wonderful! And, Ober Gatlinburg is only a short drive from the resort. 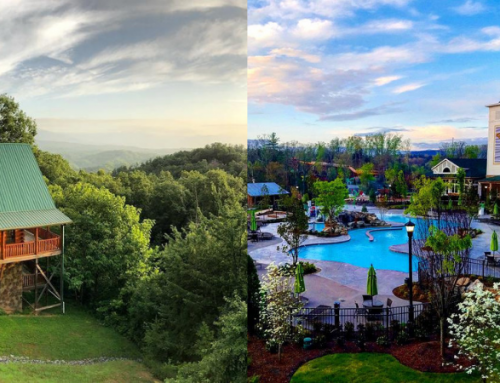 Ober Gatlinburg can be reached two different ways. One way is to drive up the mountain. The drive is only about 15 minutes from downtown Gatlinburg, but it’s a curvy and narrow road. The second (and in my opinion the better) way to reach Ober Gatlinburg is by aerial tram. 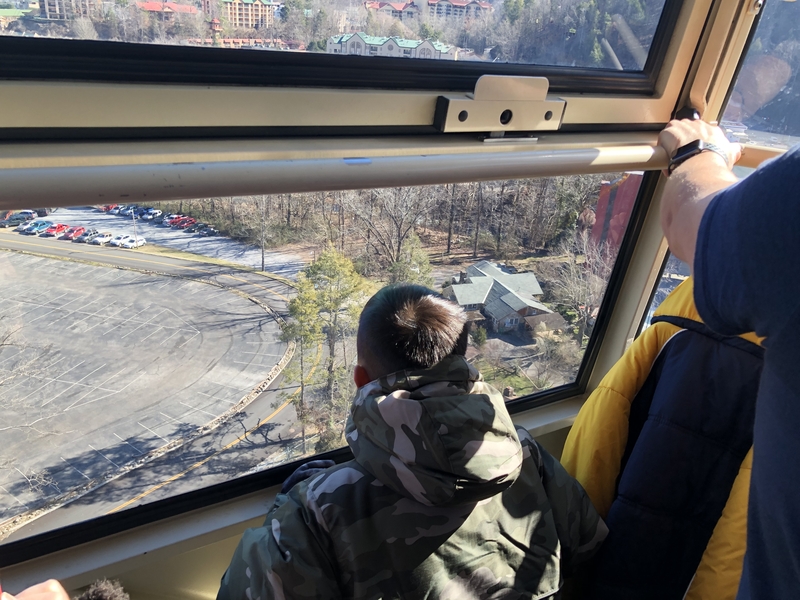 This tram travels two miles straight up the mountain for a scenic 10-minute ride and leaves from the tram stations in Gatlinburg and Ober every 20 minutes. 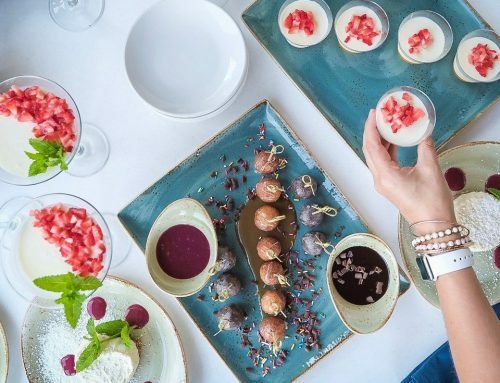 Try your best to find a spot by the window because the views are amazing. The ride up the mountain is narrated and provides great information on some not-to-miss things to see on every side of the tram. 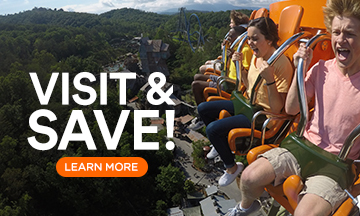 Once you get up to Ober Gatlinburg, your options are endless. Do you love snow and outside activities? Well, you are in for a treat! If there is snow, there are 10 different runs for skiing and snowboarding. Ober Gatlinburg is also able to make snow if the temperature is below freezing. It snowed the day before we arrived and the temperatures were well below freezing when we visited so there was a ton of snow. 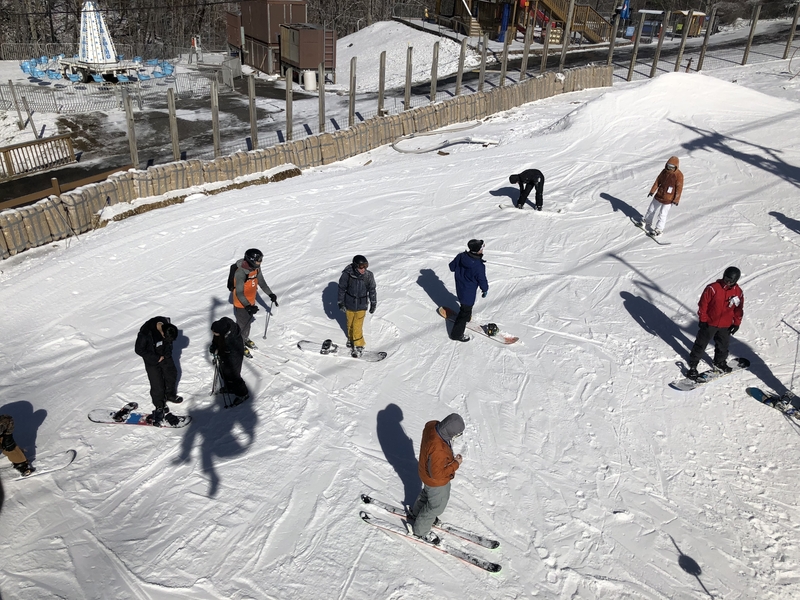 Ober Gatlinburg is a beginner-friendly mountain and offers clothing and equipment rentals along with lessons, so you have no excuses not to try! 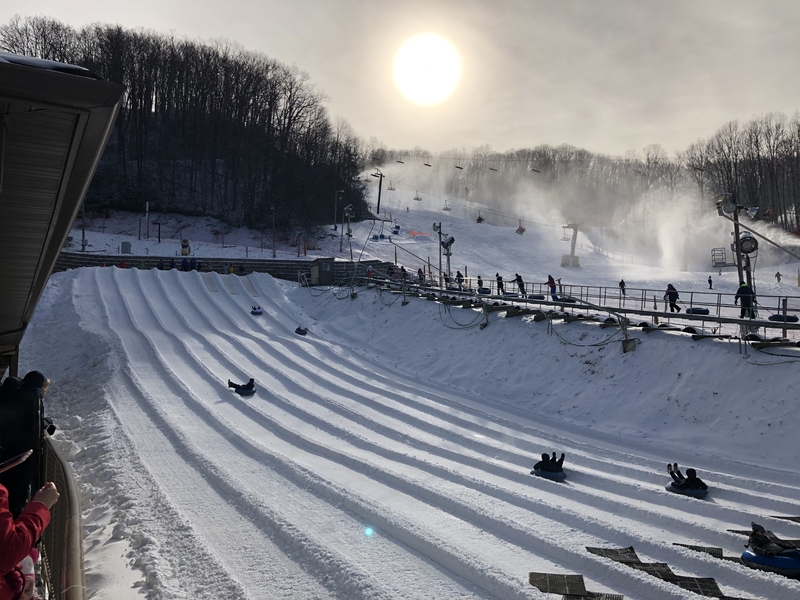 Snow tubing is offered each hour and the “magic” snow for tubing can be made in weather up to 60 degrees. This is an extremely popular activity and tickets can be purchased in advance, which is recommended. They go quickly! The scenic chairlift was a hit with our family. The 10-minute ride takes you to the highest point on the mountain. The views are spectacular and often times there’s a bluegrass band playing to welcome you! 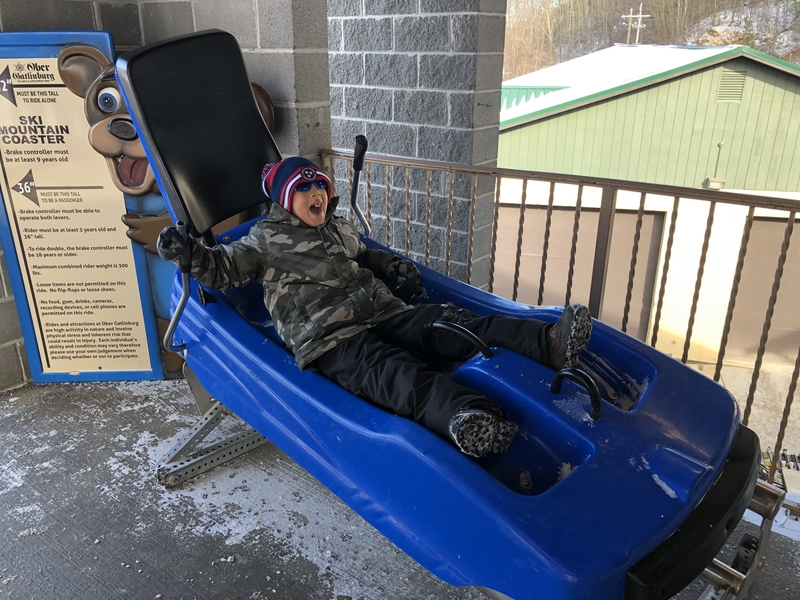 Another fun experience for the adventure lover is the Ski Mountain Coaster. This is open in the winter unless covered with frost. Little ones who just want to play in the snow are in luck with the Cubbie Snow Zone! The perfect place for kids shorter than 48” in height. The last adventure outside (with a little inside) is the Wildlife Encounter. During the winter months, the bears are usually resting, but the bobcats, river otters, birds of prey and red foxes are out and about. Ober rescues and re-homes native animals that are unable to survive in the wild. Even though the temperatures were freezing, the animals were very active when we visited! 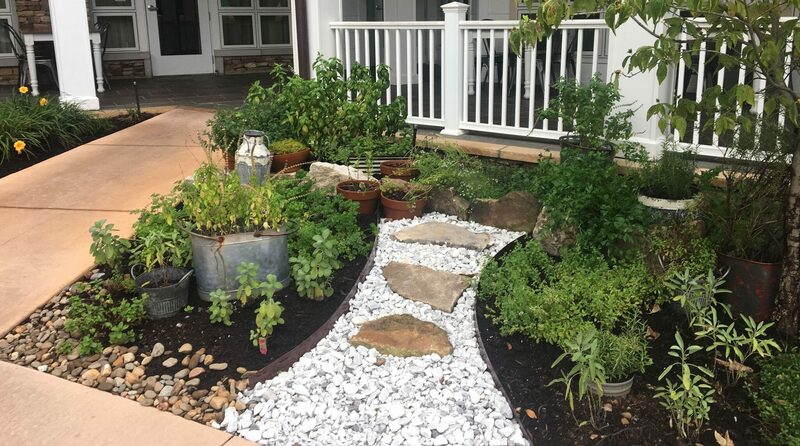 If staying out in the cold for a long time isn’t your cup of tea, Ober Gatlinburg also offers many indoor activities. 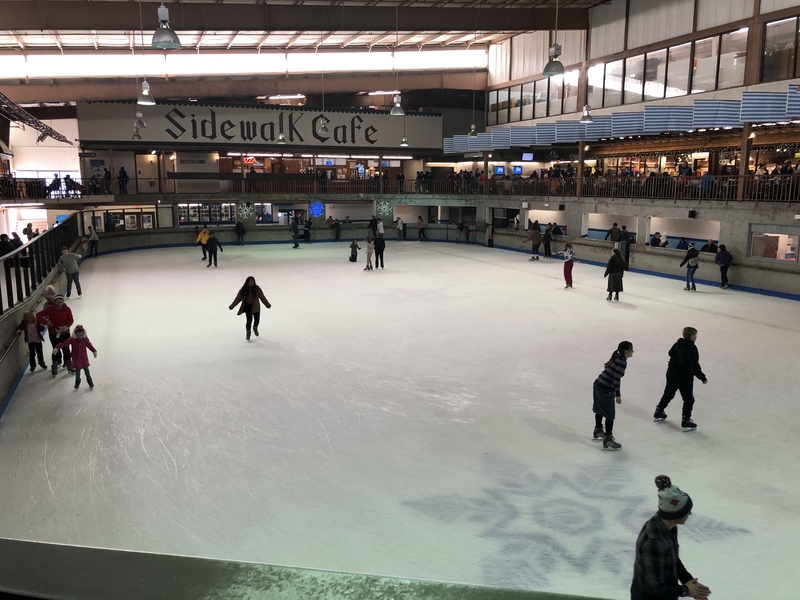 The highlight of the indoor activities is the indoor ice skating rink. While we were there the whole rink was open for ice skating, but often times Ice Bumper Cars is also offered on part of the rink. The indoor carousel is perfect for the little ones and is open all year. There is also a large arcade, tons of shopping and several places to grab a snack, a drink or a full meal! Our family had a blast at Ober Gatlinburg! 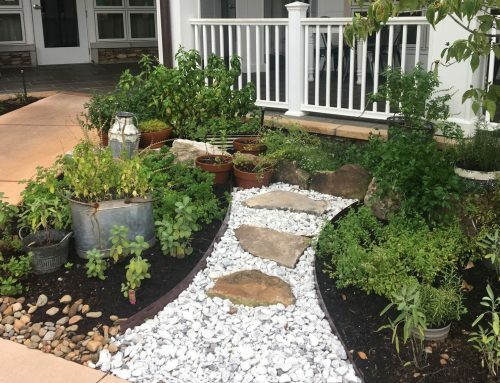 There is so much to see and do! 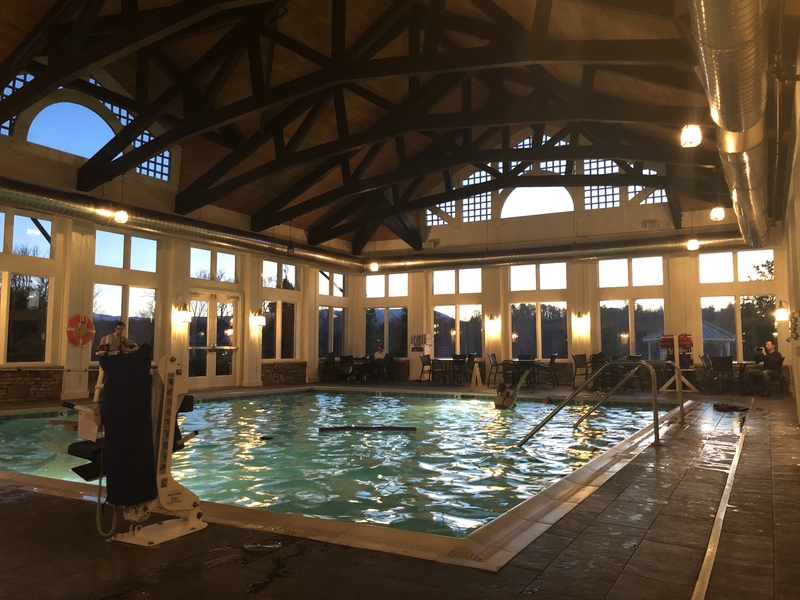 And after spending a busy afternoon doing activities in the snow, it was so much fun to come back to Dollywood’s DreamMore Resort and Spa to play a few games by the fire, hit the arcade and swim in the heated indoor pool before bed. 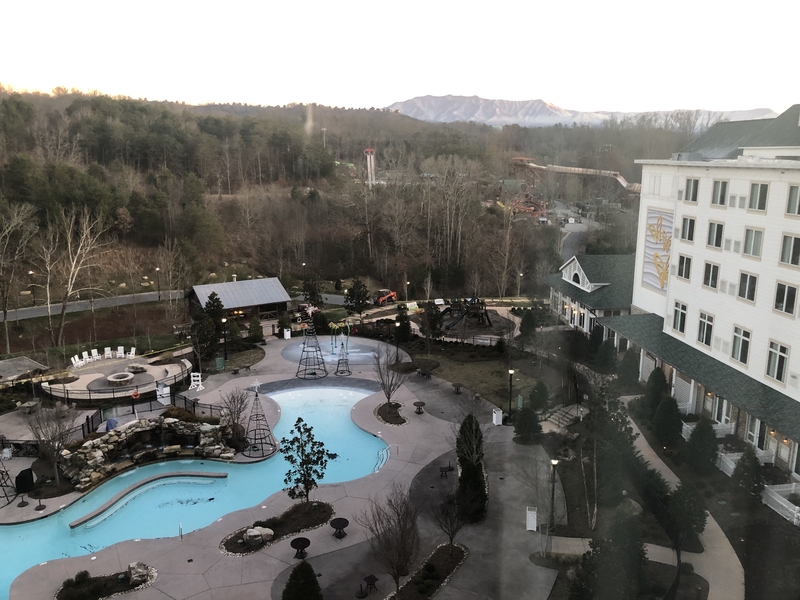 Staying at Dollywood’s resort provides the perfect setting to get out and explore all that the Smoky Mountains have to offer any time of the year, but I’m partial to winter! 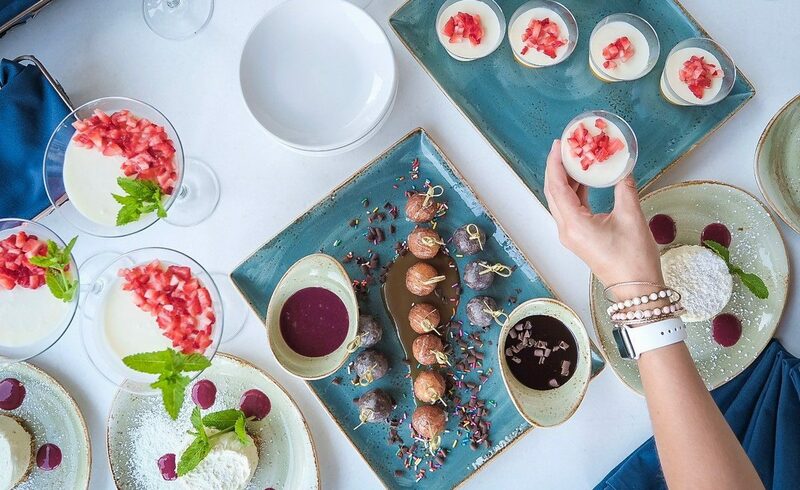 Ober is my favorite thing to package with our resort stay, but ask about all the options when you book. You could explore the Ripley’s attractions, go on a shopping spree, or go golfing! 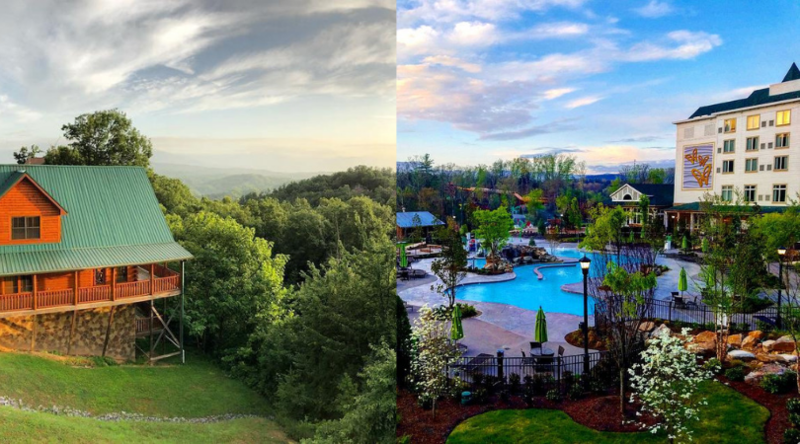 How to Decide: Resort or Cabin?